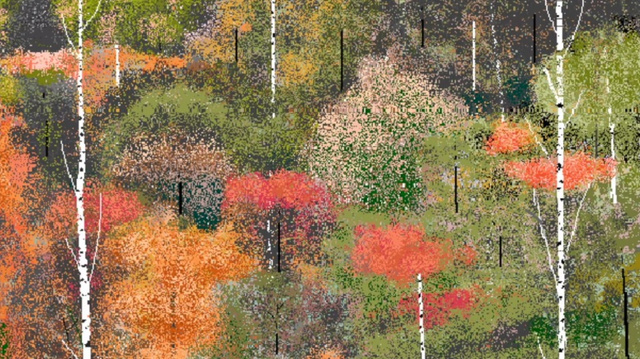 This 97-year-old uses MS Paint to make incredible art despite his impaired vision. I’m constantly reminded of ways that technology can enhance the quality of life for people; it’s truly amazing. This map uses dirt from every state, and it’s made by an 85-year-old retired ad agency art director. His favorite soils came from Colorado (“quite reddish”), Maine (“pale and sandy”), and Mississippi and Alabama (“deeply colored with iron oxide”). The soils have varying degrees of acidity, and each is a slightly different color. This machine allows anyone to work for minimum wage for as long as they like. Turning the crank on the side releases one penny every 4.97 seconds, for a total of $7.25 per hour. This corresponds to minimum wage for a person in New York. This piece is brilliant on multiple levels, particularly as social commentary. Without a doubt, most people who started operating the machine for fun would quickly grow disheartened and stop when realizing just how little they’re earning by turning this mindless crank. A person would then conceivably realize that this is what nearly two million people in the United States do every day…at much harder jobs than turning a crank. This turns the piece into a simple, yet effective argument for raising the minimum wage. Really great piece. Though, I wonder, what amount would be the tipping point that makes cranking the minimum wage machine worth it? Does minimum wage ever feel worth it? And, is there a way to re-frame / enhance / change the piece to change how people perceive minimum wage jobs? I am SO EXCITED by my new custom-made kicks courtesy of guicemann (aka Charlie)! When I was recording Flee The Scene, Kasey and Dave told me about their own spiffy sneakers, and I loved the idea. I asked Charlie if he could possibly do a pair with all of my favorite Brooklyn things, and he surpassed my expectations. I love how unique they are and how perfectly suited they are for me. I highly recommend getting a pair of your own perfectly-you shoes; I’m happy to connect you! Such a great small business. Johnathan Lopes, a Brooklyn native, built a LEGO replica of Brooklyn, complete with the Fairway in Red Hook, the historic Williamsburg Savings Bank, and the rickety A train. It’s amazing. Check out the story and gallery. I can’t believe he’ll be eventually disassembling it! I was mesmerized staring at this fountain outside of the Brooklyn Museum last Friday. Its patterns were in perfect symphony with the rest of the environment – the people, the traffic, the ice cream vending – that it felt as though the water were moving in agreement instead of on a pre-programmed track. He puts up a Christmas tree once a week and decorates it, then takes it down the next morning. A voracious reader of history, he’s been known to clip favorite words from books and eat them. Sometimes he’ll eat whole paragraphs. His New York Public Library card has been permanently revoked. He doesn’t observe Tuesdays. He wears a watch that he smashed on purpose at exactly twelve o’clock. As a result, scheduling is not his strong suit. He famously missed his own birthday by three months. Typographer’s Glossary by Playtype: Click through to view letterform anatomy, type classification, information on kerning, and other vital facts for typographers. This is a lot of information that I’ve always been curious about packaged neatly and comprehensively.